This morning the message was he was disengaged! This morning he is an opportunist. Whose word to you trust! 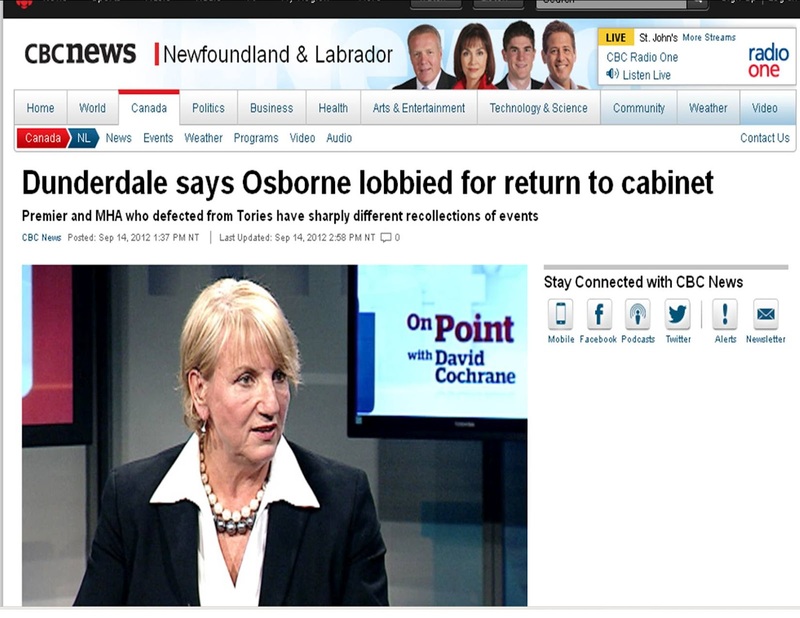 Just googled the last election results oct ll 2011 where Premier Dunderdale was giving her speech. Who was standing so close to her as he could possibly get with his hands in the clapping mode was none other than Tom Osborne. I agree with every word spoken by the Premier she is telling the truth contradicting what is coming from Osborne. I trust the Premier. Why does a light weight with no education think he is timber for cabinet. He has struck gold with his pension - a lot more than most used car salesman get! ...like seriously I trust the Premier. Why does a light weight with no education think he is timber for cabinet....Hog wash!!!! Fack!!! What’s the dragon sayin? And now may we take a closer look at Premier Dundernomics current list of education gardens or Valleys...Did she teach at Oxford???? 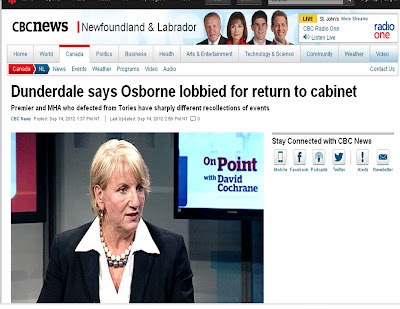 Lets have a complete published CV of premier Dunderdale…can it be Drummed up?? maybe with the loss of Tommy …. A political son to some we should consider to ask questions of the eligibility and intelligence of our leader. Or should we just eat Cake…. Interesting point...since confederation, what education, business/leadership experience have our premiers had? I'll have to do a little spread sheet! It would be interesting to look at the experience of the entire house of assembly. My own opinion is that we do not have the caliber of years past. I believe this is ue to the low salaries for mha's and the booming economy. Education may not be the best indicator though. An MHA's salary is pretty swank when you compare it to most people, plus you have to remember a third of it is tax free!